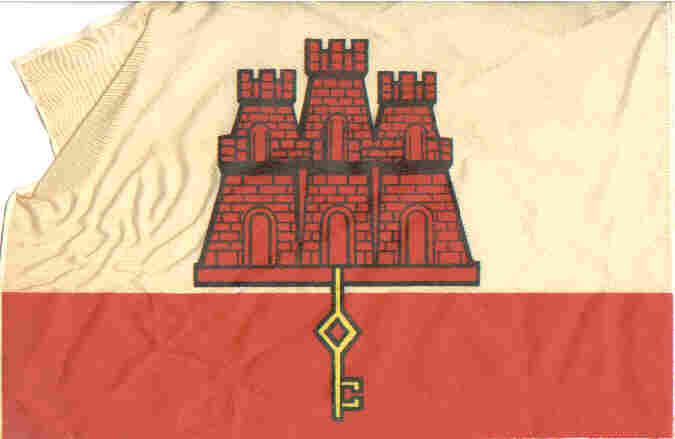 Gibraltar has a banner which shows the arms of the colony (white with a red stripe at the bottom with a three towered, two tiered red castle in the white section. Each tower has a door and a window and from the door of the middle tower hangs a gold key which mainly overlaps the red stripe) which is used a the colonies flag. Gibraltar's official flag is the Union Flag, though a banner of the original Spanish arms of the colony granted in 1502 has been in use by citizens since 1966. Crampton adds it was regularized in 1982. An unsubstantiated report I have read details that the British Government objects to a banner of Spanish arms over a British colony and has forbidden its use. The city flag is a banner of the arms, and the arms are the flag badge for both the blue ensign and now the red ensign. However, the arms today are different from what they were traditionally  a white castle and gold key on red. The city flag, which was adopted in the 1970s [actually 1982 - Ed. ], is a red castle on white but with a red stripe along the bottom into which the gold key hangs. It is this design that appears now as the flag badge, so presumably the "regularisation" Crampton speaks of was changing the arms to match the flag. Mucha 1985 p. 55 confirms this. A heraldic purist would say that a change of this magnitude represents a whole new set of arms. I wonder if the College of Arms were involved or if it was a local change? The arms of a key suspended from a chain from a three-towered castle were granted to Gibraltar in December 1501 by Queen Isabella  Gibraltar was Spanish territory until 1714. It can be seen frequently all over Gibraltar, not just in modern day flags, but in old plaques dating back centuries. Gibraltar has the same status as Bermuda, Falkland Islands etc. They used to be called Crown Colonies but are now United Kingdom Dependent Territories. Gibraltar was never a Dominion. That is an almost obsolete term that used to be used in general for independent countries in the Commonwealth that retained the British monarch as Head of State. I think that only Canada has retained that title as such. The Isle of Man has a different constitutional relationship with the UK and is known as a Crown Dependency. Dov Gutterman sent a scan from an actual flag bought in Gibraltar, according to which I made the GIF above. Please note the perspective assymetry of the castle and the unusual ratio of ~54:83, where I'd expect to find 2:3 or 3:5, both faithfully taken from the original image. Checking it against the existing image and other sources, I learnt that the "teeth" of the key should point to the hoist, hence Dov Gutterman's image had the fly on the left side. How was the other side, identical or a mirror image? I guess the unusual ratio is because of the piece of cloth used for the sleeve. And both sides showed the "teeth" pointing to the hoist. The blue ensign was adopted in 1875 by the Colonial Office. The previous blue ensign, if I recall correctly, had the shield of arms in a standard white disc. Possibly they have decided to standardise the badges of the blue and red ensigns. The Gibraltar blue ensign, used by the Government of Gibraltar vessels, used to be the official flag of the colony Gibraltar is the only remaining Crown Colony, all the others are Overseas Territories until the Gibraltar government decided to use the city flag instead. Gibraltar does have a red ensign for ships registered in Gibraltar. The ensign has the arms of the colony in a shield centered on the fly half, with the motto Montis Insignia Calpe in black on a gold scroll beneath the arms. This flag was only introduced recently (maybe this year). The red ensign is quite new, because it was adopted on the 19th March 1996, with an Order in Council dated 14th February 1996. Source: Flagmaster no. 082, 1996, Sorting out the colonies, new flags for old possessions, which gives information about Gibraltar, as well as on other British Dependencies. Gibraltar does have a red ensign (see the World Flag Database). There is a colour difference between the red used for the city flag and that for the red ensign. As far as I know they just use Union Jack's red for the arms when they are displayed in the fly, and only use the more magenta shade for the stand-alone flag. Incidently this flag can be seen flying outside the Gibraltar Government Offices in the Strand, London. I suspect that there is a blue ensign version for use by Gibraltar Government vessels. The castle and key and the Montis Insignia Calpe motto are one of the oldest battle honours in the British Army, and has figured as the badge of several regiments who defended Gibraltar during the sieges. The badge is borne on the Colours of several regiments. Gibraltar's coat-of-arms was adopted 10th July 1502. Source: Colonial Office 1932, supplementary page, volume II. The year, and information that the grant was made by King Ferdinand and Queen Isabella seems to be generally accepted, but I have not seen the day and month quoted anywhere else. This is the same badge used nowadays on the blue ensign (see this image in the World Flag Database), different from that on the red ensign (see this image from the same source). I have a photograph taken in Gibraltar with a lot of flags. These flags are white over red in a proportion of 1:2, like the flag of the colony, but, unlike this one, the castle is black and there is no key. I presumed it is the city flag. Am I right? No, the city flag is the "white over red with a red castle and gold keys" flag. This is also what the Gibraltarians consider their "national" flag. It is prefered over the blue ensign defaced with the arms, and flies outside the Gibraltar Government offices in London. I think this may just be a home-made flag. I doubt it's home-made. This photo came out in some magazine, and I cutted it out in a time when I only cutted from the photographs the flags themselves (stupid of me) and not the whole photograph. So, I don't have the whole photo. But I have two pieces of it, each with one of these flags (very small), and I distinctly remember that there where a lot of flags, many hanging vertically from ropes streched across the street. All alike. This has to be industrially made. I scanned these two photograph items. I remember that the photo showed one street filled with these ropes stretched from one side to the other, where several such flags were hanging, alternating with other ropes with small triangular pennants, plain red or blue, or with UJs in them, as seen in the detail of the blue rectangle. If you compare the two flags, you can see that they are identical and correspond more or less to my drawing (though to be really accurate I should have made it vertically) and description: the castle is black allright, but, if you watch closely the detail, you see what could perhaps be a black key beneath the castle. Now, this was obviously took during some local festivity. IMHO, the best explanation to these flags is that it's cheaper to produce flags with a black outline of the castle than those official flags with the red castle filled with black lines. In that case, I'd regard them as unofficial variations of the Gibraltar flag. My original thought was that this was the flag of the city as opposed to the flag of the colony (though the city and the colony occupy the same territory, it's not unheard of such differences - at least in Portugal they exist), but this seems to be more or less ruled out.